Those were the sentiments expressed here on Spontaneous Lunacy at the conclusion of our first meeting with Annie Laurie back in November 1947 on her initial effort in the rock spectrum, making her one of only three females to grace these pages, and rock music itself, during its first three months of existence. In the two months we’ve looked at since then the number of females have remained stuck at three, though we just got our second look at Albennie Jones earlier this month for those keeping score. So much for evening up the gender inequality issues rock was facing that we also talked about back then. But the surest way in which to level the disparate playing field would be for those women – like Jones and Laurie – who were making rock records to release sides that left no doubt as to their artistic and commercial veracity, thereby inspiring other potential artists to jump into the fray themselves and enticing record labels and producers to seek out their own female stars. Of course that’s easier said than done, as Laurie proves once again here with a song that holds so much potential and a performance that hints at something special, but ultimately remains more frustrating than fulfilling. At the risk of making the next 15 years of reviews on Laurie that will adorn these pages somewhat superfluous I’ll let you all in on the fact that she would go on to leave her mark on rock history, scoring a number of hits along the way. But hits or not Laurie hasn’t been celebrated much in the years since. Surely many a newcomer seeking information on her career find themselves confused by doing Google or Youtube searches that result in page after page of the song “Annie Laurie”, a Scottish folk tune from the mid-1800’s that has been recorded by a lot of diverse characters over the years, rather than the singer Annie Laurie who was a mainstay of producer and musician Paul Gayten’s crack ensemble. It doesn’t help that no less than four films about the song’s character (derived originally from a poem in case you were wondering) were also made in the twenty years prior to our Annie Laurie’s appearance on the scene, not to mention having the aforementioned song used in the popular 1946 movie A Tree Grows In Brooklyn. By that point I’m sure most give up on trying to find out anything substantial about Annie Laurie the vocalist and head off to bed, kicking themselves for wasting four hours of their lives in such a futile search for information. 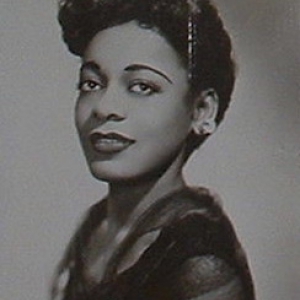 So while her unique moniker may have even initially helped as a promotional gimmick (though it was close to her real name, which was reputedly Annie Laurie Page), it’s possible that also helped to rob her of some notoriety along the way. But at the time of this release she was still most definitely a recognizable figure from the previous summer’s Since I Fell For You, which while a ballad that pre-dated rock’s arrival was a huge hit that managed to cross over into the pop listings. In fact of everybody we’ve met thus far she likely had the most name recognition, or certainly rivaled by just a small few, giving her a leg up for courting interest for a new release as well as being almost an instant advertisement for this style of music itself. Yet on all of her work there’s an equal amount of good points and bad and while those points vary from song to song, sometimes within the SAME song, the end results of those teeter-totter rides is that everything settles in the middle… decidedly average. So they try again with One Sweet Letter From You an effective torch song that should be the right fit for her emerging talents. It starts off a little disjointedly, instruments seeming as if they were written to clash in the intro before finally settling in for the most part. As with I Still Love You the arrangement has a bit of a skeletal half-finished quality to it all. They’ve improved on this each time out, yet are still a ways off from really having an arrangement that seems complete. It’s not helped much by the recording quality which is poorer than most of the songs we’ve come across so far, with a crackle to it that sounds as if the master might’ve been lost in the years since and the best surviving vinyl copy has been serving as the source for re-mastered versions we hear today. Laurie contributes to this maddening up and down quality her records seemed cursed with. On one hand her voice at its best can sound sultry without being overly dramatic, earthy without being coarse, soulful without being gospelish, yet her delivery at times is very strident and diminishes the appeal somewhat. It helps here that she has a good melody to ride over and lyrics that are simple, but well-crafted, and thus at first glance you come away with a better opinion of the record overall than if you choose to study it TOO closely. But since that’s my job I have no choice but to study it closely. Unfortunately peeling back the layers reveals that while the packaging was made to catch your eye, its contents leave a little more to be desired. Aside from its simplicity, which is not a detriment unto itself, for many great records have simple structures and lyrics, what starts to stand out during repeated spins is that Laurie’s not really projecting the song properly from an emotional standpoint. Her voice rises and falls with the arrangement rather than the sentiments. It’s not a personal interpretation of the song she offers as much as simply a straightforward recitation of it. Mostly there’s no sense she’s actually aware of what’s being conveyed in the lyrics, and as a result, neither are you. She offers us a lovelorn woman whose man went away, but the circumstances remain an utter mystery, to her and to us. Where did he go? The army? Prison? Is he a traveling salesman? A wandering philanderer off to see another woman? Why did he leave? Something she did? He did? Is he expected back? When? Is the lack of any correspondence startling to her, is she worried something happened to him? Were they even that close to begin with? Maybe he was just a brief liaison and now, left alone, she thinks back at what might’ve been. All are possible, yet none are confirmed. I suppose if you want to play amateur detective and try and decipher the meaning in the lyrics you can do so. It sounds from some of the lines as if they weren’t together long, he gradually got tired of her for some reason and simply moved on, and the song is something of an apology and a plea rolled into one, but I certainly wouldn’t feel confident betting my shirt on it either. It’s not that we need specifics, this isn’t a police report after all, but we DO need a sense of what she’s feeling and why, something those specifics would provide. She can even keep them to herself… provided SHE knows what they are and that knowledge is imparted in her delivery somehow. What we get from Laurie instead is simply the overall situation in bare bones terms. She’s craving a message of some sort from him but the reasons that would go a long way into revealing her true emotional state – desperation, anguish, hurt, fear, lust, resentment, longing, horniness – information which may be only faintly implied, but which helps make the best music transcendent, are a mystery. A mystery to us as the listeners, but also, sadly, they seem to be a mystery to her as well. But she was hardly alone in this quandary, as unfortunately this song’s emotional haziness seemed to be the case from the time Annette Hanshaw first laid it down way back in 1926 with a scene-setting intro that was cut from Laurie’s version, and which I was hoping might shed some light on the particulars of this fizzled romance, but Annette hasn’t a clue either. Despite this universal confusion over its meaning the song was quite popular over the years with a lot of big names committing it to wax, but strangely enough nobody seemed to get a grasp on the emotional content, from Kate Smith’s painful warbling of it in 1927 to Spade Cooley’s western swing version that sounds so artificially polite that he’s hard to take seriously. Bing Crosby is half-asleep during his reading of it as usual, and as warm and technically perfect as his delivery may be it gives you an idea that he’s not exactly too shaken up by the departure of his sweetie either. Sophie Tucker, a big star back in the 20’s, actually DOES manage to sound as if she’s on the verge of a breakdown over this turn of events but it’s too over-the-top for its own good so you end up hoping that she’ll just crack up by the bridge and be sent to Bellevue for a nice little “vacation”. Years later Bill Haley took a swing at this too and steamrolled over the sentiments it required, nothing surprising there I suppose, as he did the same with all of his songs. But the unifying trait they all share is that no matter who did it and what era or style they came from they all seemed to have the same problems connecting the storyline with an appropriate mood with which to deliver the lyrics. Thus the best versions by far seem to be the jazz instrumental takes on it because I suppose clarinetists, trumpeters and saxophonists aren’t even allowed to scan the lyrics since they won’t be using them anyway and so they simply dress up the melody, with Bunk Johnson’s crew turning in a spry version that tops the list for sheer enjoyment. But for OUR purposes it helps to know what the singer’s mindset is and since it’s more than hinted it lyrically throughout we have every reason to expect that to be conveyed to us. It’s not as if Laurie has to even inhabit the SAME mindset as those who came before her, but she simply has to choose one of about a half dozen potential reasons she’s feeling this way, any of which will suffice as long as she sticks to her story from start to finish. Her failure to do so is why this winds up being so frustrating. Since she never zeroes in on the motivations behind these words it becomes mere artifice, a puzzle left unsolved and thus leaves us with no deep seated connection to it, or to her. As a result it becomes sort of a schizophrenic performance – to me anyway. One Sweet Letter From You has a melody that will stick in your head for a long time and Laurie’s voice sounds fine on the surface, but there’s nothing UNDER the surface to win you over. Gayten on piano is strong for the most part and while the muted guitar is a little too jazzy at times, that’s a minor complaint, as otherwise the arrangement is a definite step-up from their last outing. If I hear it in passing I like it much more than if I’m trying to listen intently and work up some sympathy for her plight and so it comes off as a missed opportunity at best. Instead of being “very good” it instead winds up as being simply “good enough”. At once listenable and enjoyable, yet also somewhat disappointing because we know how much better it could’ve been if only she wasn’t so demure about letting us peer into her soul. 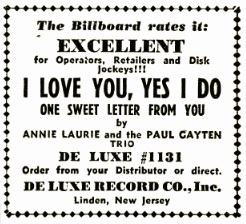 Leave a reply on "Annie Laurie: “One Sweet Letter From You”"